It's been awhile since I've sat down to do a book review! 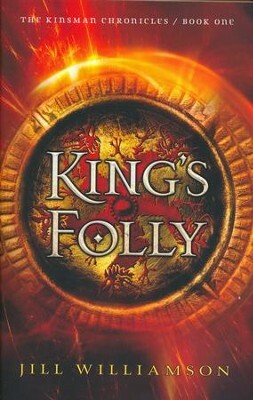 Today I have "King's Folly" by Jill Williamson to review, and I must say I felt terribly excited to check this author out. This is the first time I've had the chance to read one of her books, and I've heard many things about previous works released by Ms. Williamson. King's Folly is the first book in the Kinsman Chronicles, focusing on many characters, the two main ones being Trevn and Wilek, as well their family, in a time where the world is seemingly about to end. The earth quakes, horrible storms are constant - the gods are angry. Darkness is covering parts of the realms, which are teetering very close to coming to war. Armania is in danger, people are dying, and Wilek must learn what is going on before it's too late and the world falls away. This book is full of a wide range of characters, places, and a very different genre then I'm used to. Ms. Williamson gives us a story that is vast and very, very, complex. This isn't a simple story, but one that is full of magic, gods, and the sins that have bound Armania, such as having more then one wife, the taking of concubines, etc. I think Trevn was my favorite character of the lot and the most interesting - I followed his story with a lot of hope that he'll rule one day! The writing style is really good, with just enough contemporary style to allow you to understand what the author is saying but with the biblical/fantasy overshadowing. I'm not a fan of the biblical feel (preferring dragons and castles myself), but the plot is good - a lot being at stake in the story, and it is (at times) very dark. For something different it was a good read - not at all the norm. Which can be good because it will stand out more in its genre. the wide range of characters. Always nice to have that, making everything more realistic. However, the book jumps to a new character pretty often in the first part (Darkness Reigns), making this story a MUST to read very slowly and taking me quite a bit to get into the story. By the third part of the book (even with the jumping about) I was enthralled, but it took a bit for Ms. Williamson to deliver me into the story enough to understand it. I wanted to get to the main characters as quickly as possible and stay there to get to know them, but we ended up with some of the later more villainous characters as well as minor people. This is fine, but it went a bit too far and much of the time I needed to stop and look over what I read, trying to figure out who was who (the names of the characters also are a bit hard to get used to). There is something I look forward to - the country doesn't believe in the one true God, but many, and I can't wait to see how the story changes as they find Him, how they will take their places in the book - will they follow Him or continue the way they are at the moment? That being said, I think I will enjoy book 2 more because I will re read book 1 beforehand, reacquainting myself with the characters and understanding and gleaning more from the story (always do second time around). This is a good piece of fantasy, the vastness not always great because of needing to understand it all, but it's still good. I recommend this to any fantasy lover out there - anyone who is a fan of Jill Williamson will probably love this book too because it is good! Bethany House sent me this book for free (isn't that always an amazing word?! ;) in exchange for reviewing it with my honest opinion. Thank you!